Vitamin B12 is also known as cobalamin and is an essential vitamin absorbed in the guts of mammals. 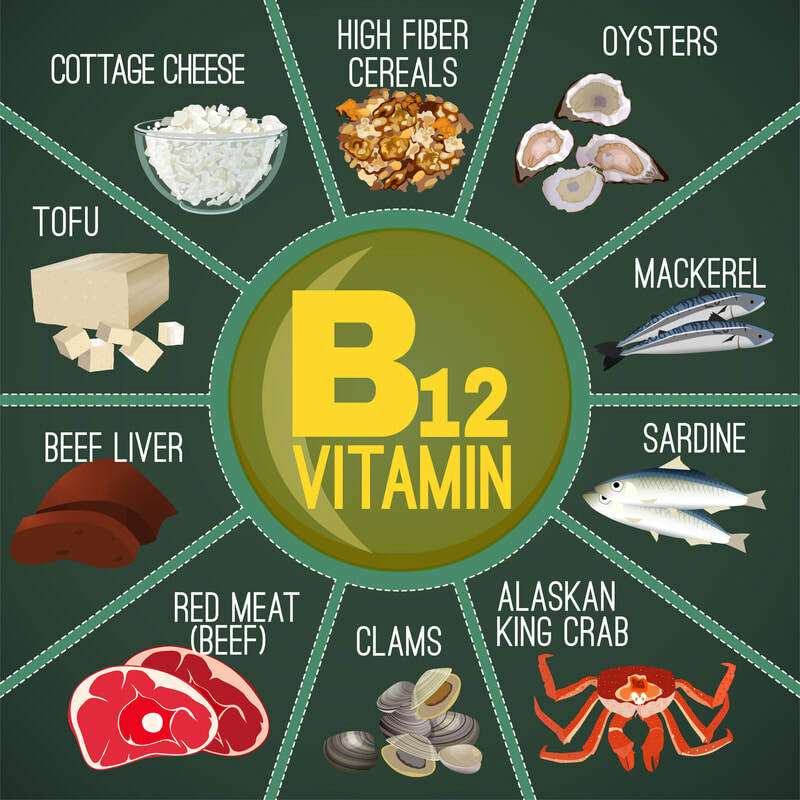 Vitamin B12 helps process some amino acids among other important functions in the body. Deficiencies in cobalamin levels in blood have been associated with gastrointestinal disease. Diseases like chronic gastrointestinal inflammation, intestinal lymphoma, and exocrine pancreatic insufficiency can lead to low blood levels of cobalamin. For these patients, there is disease an the guts are unable to absorb the Vitamin B12 like normal. This leads to depletion of the vitamin stores in the body. Without supplementation, these pet become deficient. Studies in humans have found that being deficient in Vitamin B12 have been linked with dementia and anemia. A condition called Imerslund-Gräsbeck syndrome is a hereditary cobalamin deficiency seen in certain breeds such as the Giant Schnauzer, Border Collie, Australian Sheperd Dog, and Beagles. ​There is still research being done on how much cobalamin plays in the health of our pets, and Texas A & M University's Gastrointestinal Lab is at the forefront of GI health. Studies conducted at the GI lab, show in cats an increase in an acid called methylmalonic acid with low levels of cobalamin. Once cobalamin supplementation was started and serum concentrations of Vitamin B12 were normal, this acid decreased again. There may be a link between an increase in this acid and weight loss, vomiting, and diarrhea. Similarly, in dogs with EPI (exocrine pancreatic insufficiency) cobalamin levels can be decreased and these pets will need supplementation of Vitamin B12 even once the EPI is controlled. Some of the benefits of supplementing Vitamin B12 it can stimulate pets to eat better. According to Texas A&M, with serum cobalamin concentrations below 400 ng/L supplementation is recommended. Commonly cyanocobalamin (Vitamin B12) is given either orally or as an injection. Please follow your veterinarians recommendation for dosing and brand recommended. When giving the orally vitamin B12 the current recommendation is to give the cobalamin once daily for 12 weeks and then rechecking the serum cobalamin level. 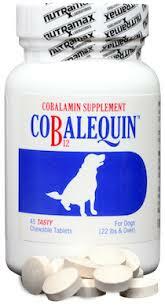 At this time, we recommend using Cobalequin from Nutramax. This can be purchased through your primary veterinarian or from a reputable veterinary pharmacy. If you're looking for a pharmacy that carries this, check out our page on pharmacies that carry medications for dogs and cats here. Giving the injectable vitamin B12 is once a week for 6 weeks, then one dose a month later. Recheck of the serum cobalamin level should be done 1 month after the final injection. This injection is given under the skin with a small gauge needle. The dose will be determined by your veterinarian and this is typically dispensed at your veterinary clinic. How Long Will My Pet Be On Supplementation? The results of the recheck serum cobalamin levels will determine how long your pet will receive supplementation. Ideally when rechecking the cobalamin level, your pet should be above the normal range. This means the storage supply of Vitamin B12 is restored and supplementation can be discontinued. However, if the results are within the normal range it is recommended to supplement for a minimum of one more month. If your pet's cobalamin level is still low, further work up is recommended to find the reason behind this and indefinite supplementation is recommended.